There are not many things in my life that I am OCD about, but my smile is absolutely one of them. Maybe it is because I am a pretty happy person and I like to smile… a lot. Maybe it is because I work in an industry of relationships and I have found that smiles breakdown most any barrier. Maybe I have just read a lot and know WAY too much about what you should expect your teeth to look like to be properly aligned. Whatever the reason is, I know when one of my teeth moves out of place and I am a DEVOTED retainer wearer. That is until the puppy enters the equation. You don’t have to know all the details, but those appliances in your mouth are just impossible for puppies to resist. Without my retainer, a teeth shift was imminent. Six months later, I find myself sitting in the chair at the office of Orthodontics by Birth and Fletcher, ready to see what we could do about these “few teeth” that are moving. I have had braces before, and I am not fond of getting braces again as a “mature adult” (let’s just leave age out of this). The exam was surprisingly easy and quite informative. I was quickly told that Invisalign® was a great way to accomplish what I needed and to get the teeth moved where I wanted. Everyone at Orthodontics by Birth and Fletcher in Keller was wonderful, and there were many pleasant surprises in the visit. There was NO CHARGE for me being evaluated, which it is always a pleasant surprise in the healthcare world. They estimated my treatment time to be less than 8 months (WOW) and the trays were quite unnoticeable unlike traditional metal braces. The doctor herself was even wearing them and I could not tell until she called attention to it! Once I decided I was ready to begin treatment came the most pleasant surprise. As a child of the 80’s, I recall vividly the horror of the goopy impression material that was used to take impressions of my teeth. I tend to get a little gag reflex, so I can work myself into quite an anxious fit anticipating that mouth full of “mush”. In this new age of technology, I was thankful to find out I was going to be “scanned” by the machine they called the iTero Scanner. Not only was it fascinating to see the digital rendition of my teeth, I just got to sit there while they scanned my teeth! No goop, no gagging, just a gentle wand over my teeth! It was amazing and I am super impressed with the technology they have in the office. In two weeks, I will return to see the “plan” and how my teeth will move in the coming months! I can’t wait to see the change! 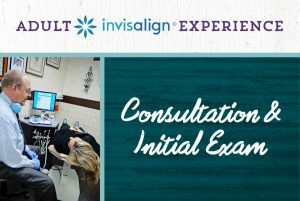 I thought this would be a great time to let the adult patients considering Invisalign to know what to expect. Enjoy this journey – I know I will enjoy my new smile!